Whether hard boiled or soft boiled, what's the best way to boil an egg? I like my eggs soft boiled (dippy eggs as my children call them) so for a small egg it's three and a half minutes and for a medium to large egg I'll give it four. If the egg cracks then it becomes a bit of a lottery...but that's not all there is too it. Note:- For smoking eggs then you need to hard boil the egg rather than soft boil and here are the tips for hard boiling eggs. I was listening to the radio the other day when I heard this egg boiling tip and it really does appear to work. The secret is to drop two matches into the boiling water before the egg. I don't understand the chemistry behind it but I gather that it's something to do with how the phosphorous in the head of the match reacts but so long as it works, do we really care? 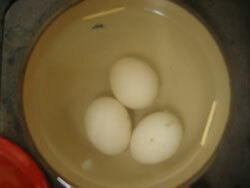 In addition you can also stop your egg bouncing around in boiling water by adding a tablespoon of vinegar to the water. So next time you fancy a dippy egg, give these egg boiling tips a whirl and see what you think. Having given my timings on eggs there's still a couple of things to take into account. For the sake of this discussion let's agree that I've got a large egg and the basic rule of thumb is 4 minutes for a soft boiled egg and 7 minutes for hard. Two other factors can have an effect on timing and they are salt and altitude. The addition of salt to boiling water will have the effect of raising the boiling point by approximately half of one degree Celsius (1 degree Fahrenheit). Not overly significant but the time taken to boil an egg will reduce very slightly. More significant is the effect of altitude especially if over about 2000ft (or 600m) were the boiling point of water will be reduced by 2°C or 3½°F and this reduction will necessitate and increase in cooking time. Note also that the amount of water evaporation will be higher too. If you are a regular skier you'll probably have noticed this effect (I give my eggs an extra 30 secs when skiing) because with a resort height of 1000m (over 3000ft) the boiling point of water is 96.8°C (206.2°F). If you're thinking of trying my recipe how to make smoked eggs then the first thing that you need to do is hard boil the eggs and this method has proven fail safe over the years. It may seem a bit of a palaver when you get to the cooling stage but it is by using this method that you avoid the green / grey yolk that you sometimes get with hard boiled eggs. The grey colouration arises as a result of a chemical reaction between sulphur in the egg white and iron in the egg yolk forming a sulphide ring around the outside of the yolk. To be fair the grey tinge to the yolk is harmless but it doesn't look great and can easily be avoided. It is generally found when the eggs have been overcooked so the trick is to stop the cooking process as quickly as possible once the eggs have hard boiled. Place the eggs into a pan, cover with cold water and place them on the heat. As soon as you see the water getting to a rolling boil point, set a timer for 8 minutes. When the timer alarm goes off remove from heat, empty water from pan and add cold water and some ice cubes. Change the water every 10 minutes or so until the eggs are cool. It works every time. Have You Got The Best Ever Cooking Tip Up Your Sleeve? Do you have a great cooking tip that will make life easier? Do you know how to...........? If so, please share your knowledge and make someone's day. A picture on this type of page really helps folks understand so please upload it if you can. Note that you will have to reduce the number of pixels to about 250 x 190 so that it will easily load up.